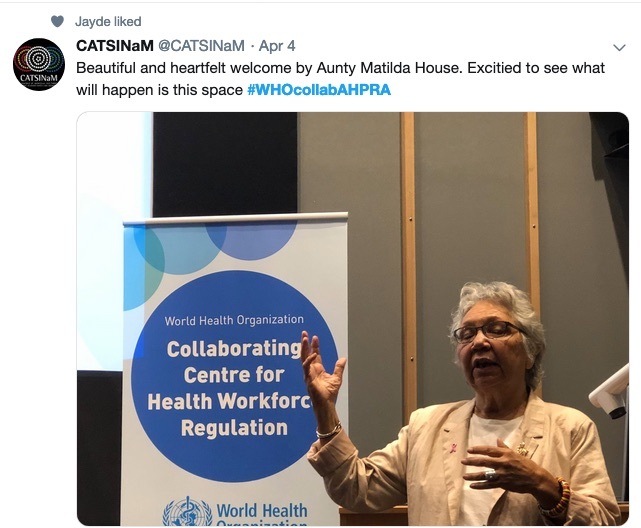 The importance of health workforce regulation across wide ranging areas, including the quality and safety of healthcare, environmental sustainability and social justice was highlighted at a recent event in Canberra. 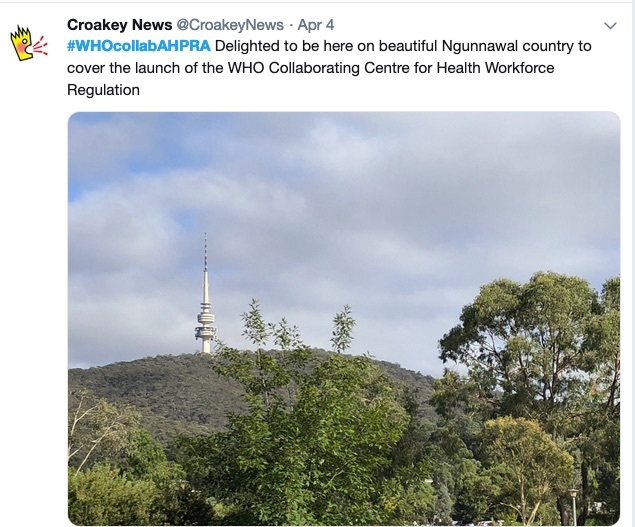 Jennifer Doggett reports below on the launch of the Australian Health Practitioner Regulation Agency’s (AHPRA) designation as a World Health Organization (WHO) Collaborating Centre for Health Workforce Regulation, for the Croakey Conference News Service. 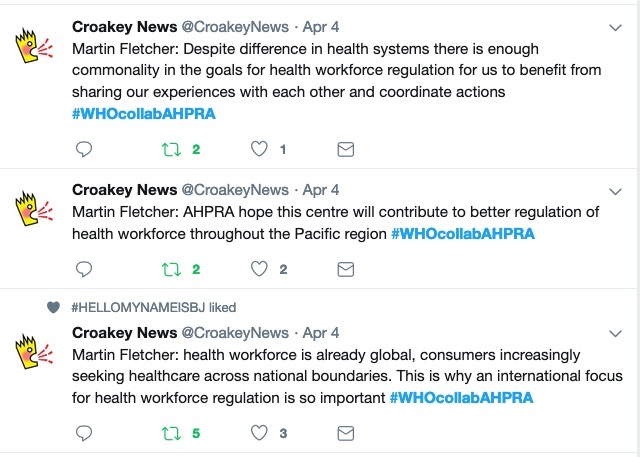 The Australian Health Practitioner Regulation Agency (AHPRA) has been recognised as a leader in the Pacific region with an official designation from the World Health Organization (WHO) as a Collaborating Centre for health workforce regulation. 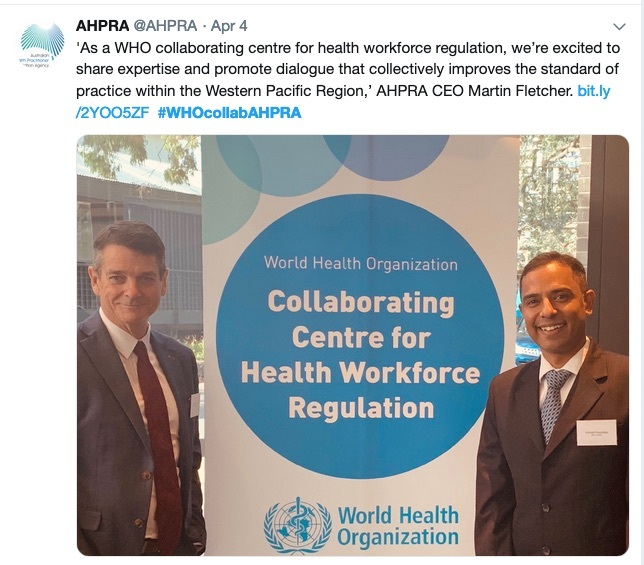 This designation means that AHPRA, in partnership with National Boards, will work with WHO and its Member States in the Western Pacific to strengthen regulatory practices across the region. 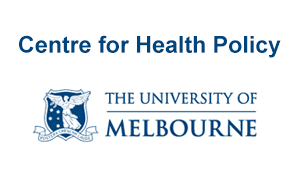 The Collaborating Centre was officially launched last week at the Australian National University in Canberra at an event attended by health and medical groups, representatives of WHO, delegates from Western Pacific nations and others with an interest in health care in this region. 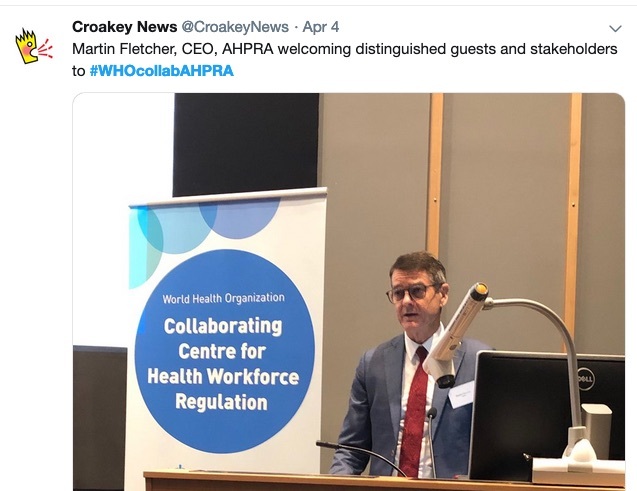 Fletcher went on to explain the importance of taking an international approach to health workforce regulation, given the global nature of the health workforce and the increasing trend for consumers to seek healthcare across national boundaries. 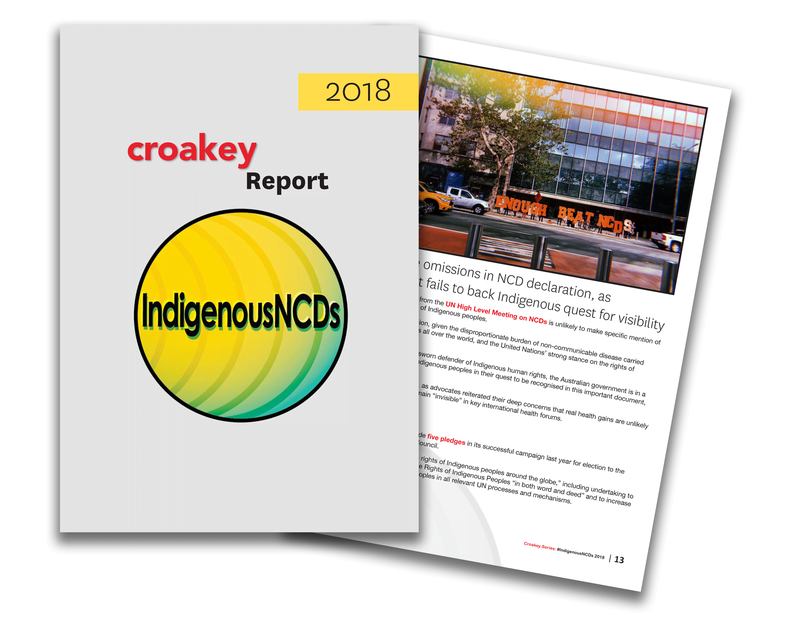 He acknowledged the significant differences in health systems throughout the Pacific region but stressed that there is enough commonality in regulatory goals regulation for all countries to benefit from sharing experiences and coordinating actions. 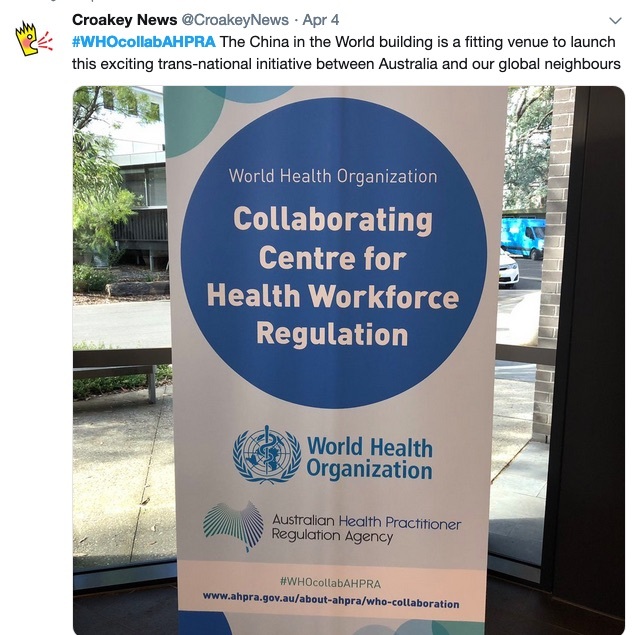 A major benefit of the Centre, according to Fletcher, comes from the involvement of the WHO, which will facilitate input from the international regulatory community, including from other (non-health) sectors. 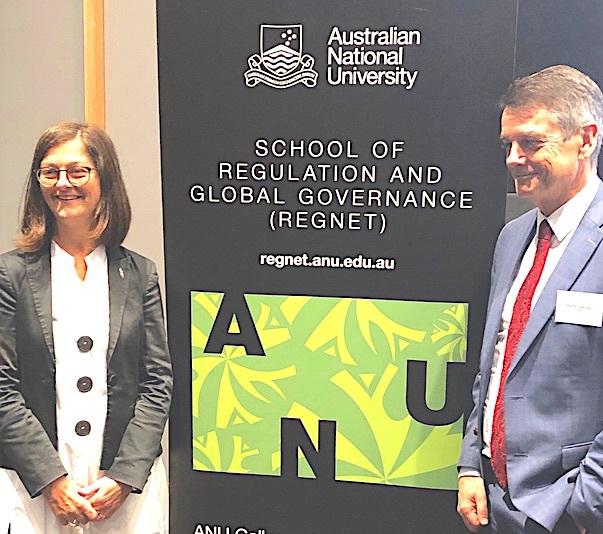 Professor Sharon Friel, Director, School of Regulation and Global Governance (RegNet) and Professor of Health Equity at ANU’s College of Asia and the Pacific, also noted the importance of WHO involvement in the Centre. 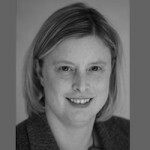 Friel challenged attendees to focus on the end purpose of workforce regulation, outlining its importance in improving not only health but also environmental sustainability and social justice. 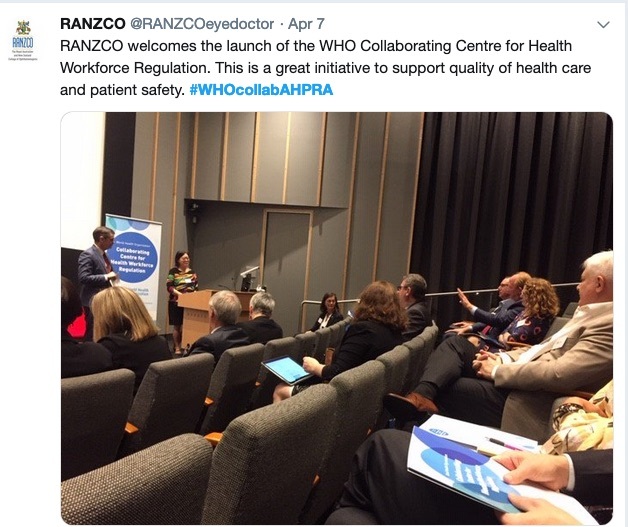 She also described the Centre’s creation as a “wonderful opportunity” and discussed how the collaboration with the WHO would provide “incredible reach, technical support and legitimacy”. Representing WHO at the launch was Indrajit Hazarika from the Western Pacific Regional Office. 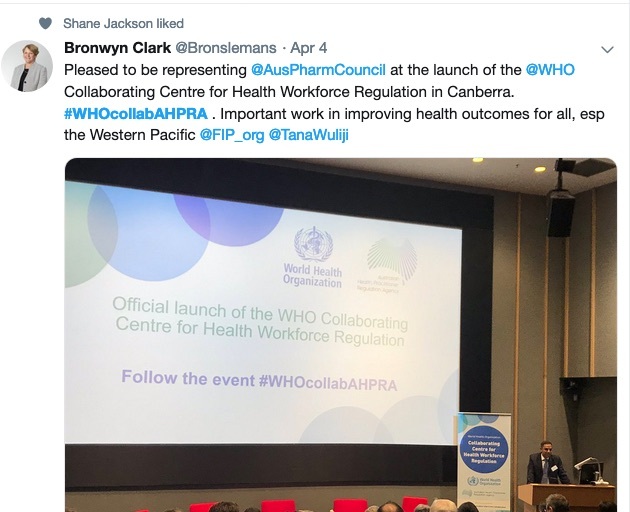 He praised AHPRA’s achievements in Australia, adding that he was looking forward to seeing how the Agency could work with other nations in the region to share its knowledge and experience. 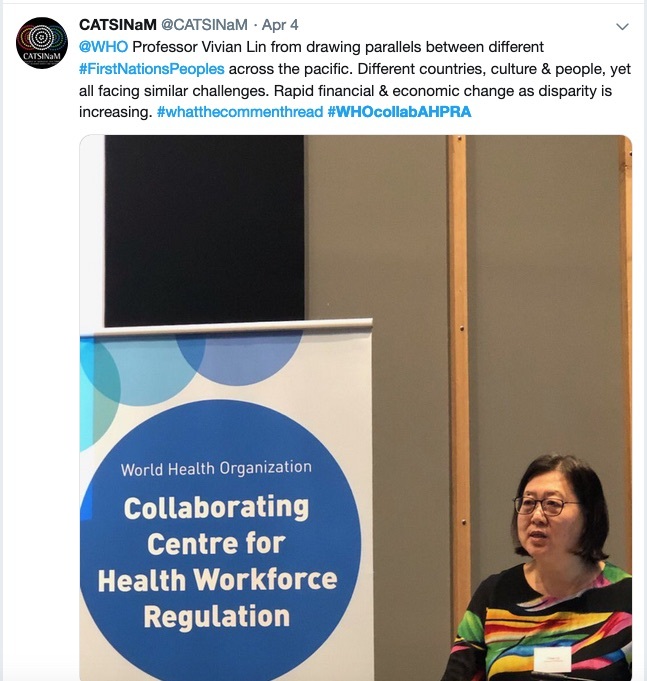 The role of workforce regulation in the broader health system was stressed by Professor Vivian Lin, former Director, Health Systems Division, Western Pacific Region, WHO, in her keynote address. 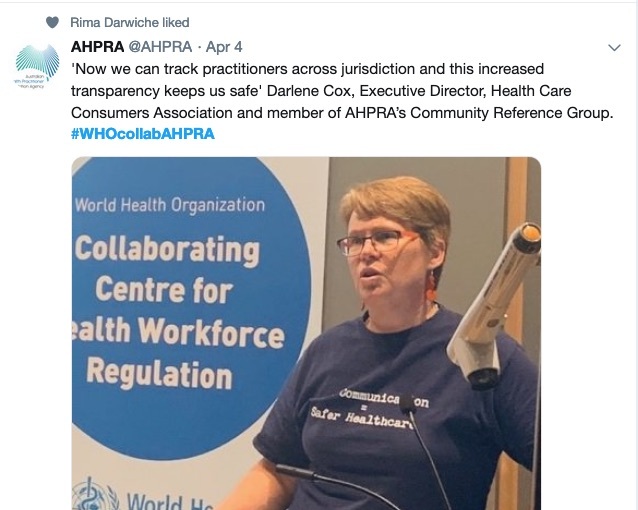 She argued that universal health care is more than just financial coverage and includes a focus on achieving equitable and sustainable outcomes. 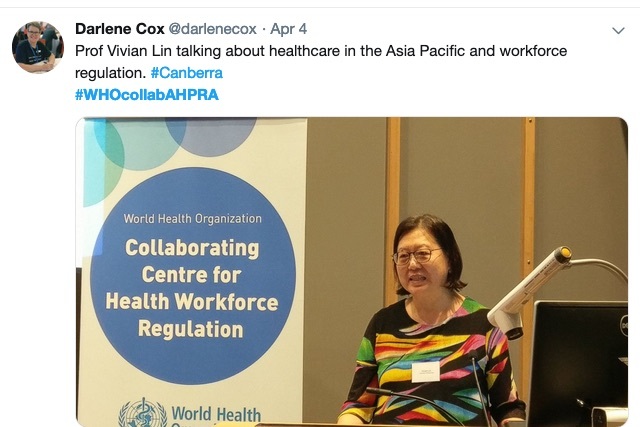 Lin described regulation and the regulatory environment as “setting the floor” for the minimum acceptable standard of health care. 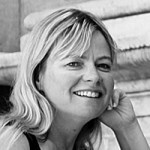 She argued for a strong practical focus for regulatory systems, stating that “systems and policies need to be built around practice, not the other way around”. 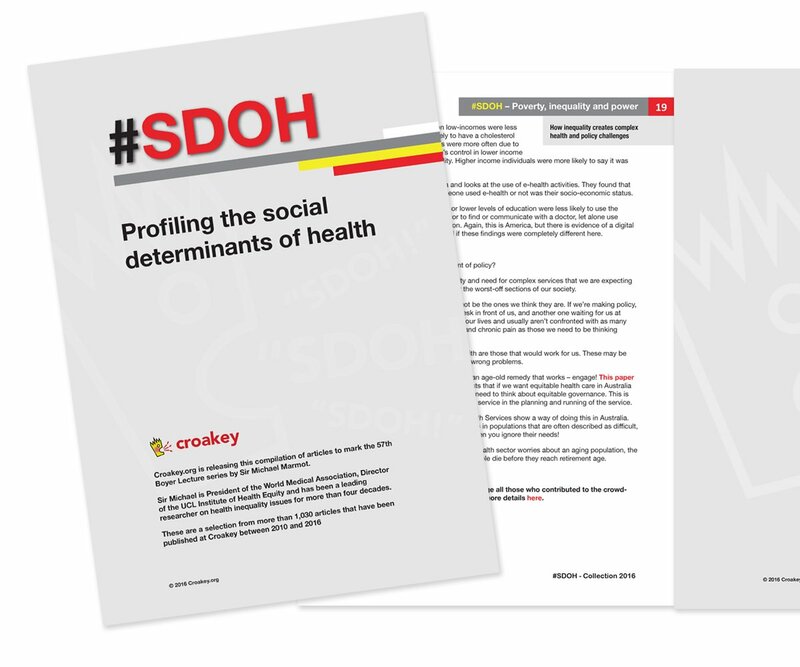 Lin also stressed the importance of taking into account the social determinants of health and cultural differences in health care. 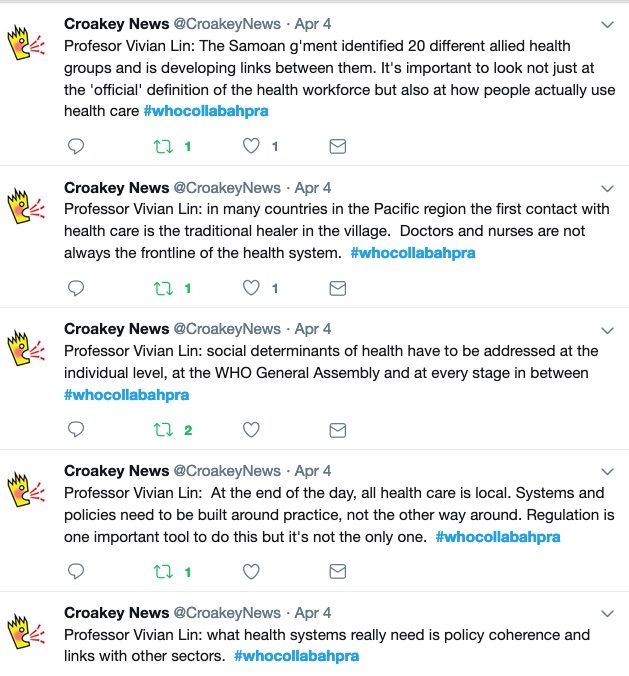 She gave some relevant examples, including the 20 different allied health groups identified in Samoa and the important role of traditional healers in many Western Pacific nations. 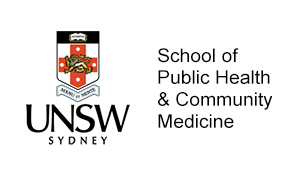 An important message from her address is that “each country has its own pathway to universal health care but they all will need a qualified and regulated health workforce”. 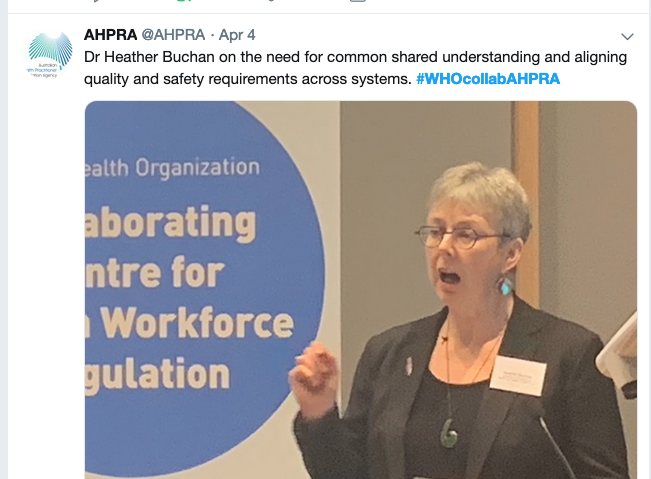 Dr Heather Buchan, Medical Advisor, Healthcare Variation, at the Australian Commission for Safety and Quality in Health Care (ACSQHC), discussed the importance of behaviours and knowledge to health system standards. She emphasised the role of teamwork and communication between health care providers as vital in promoting safe, high-quality health care. 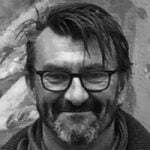 Buchan also described how clinical governance requires the health workforce to monitor variation in health care practice against both expected outcomes and external measures and also to report any variation to clinicians. 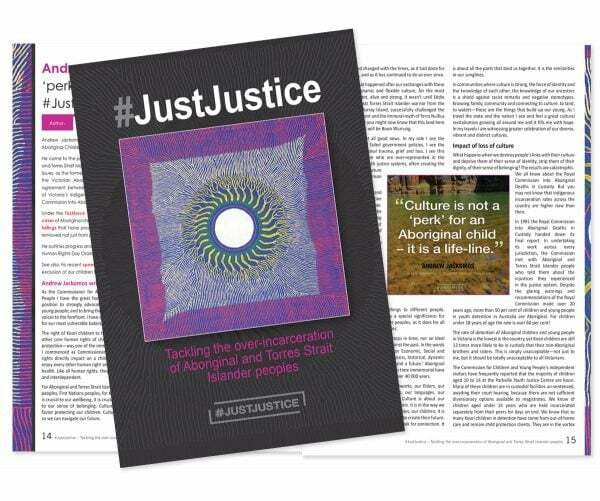 This relies on the health workforce having access to relevant data and being supported to use best practice guidelines. 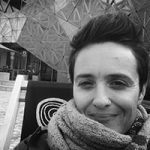 From her work at ACSQHC, Buchan identified seven key issues in improving safety and quality in health care. 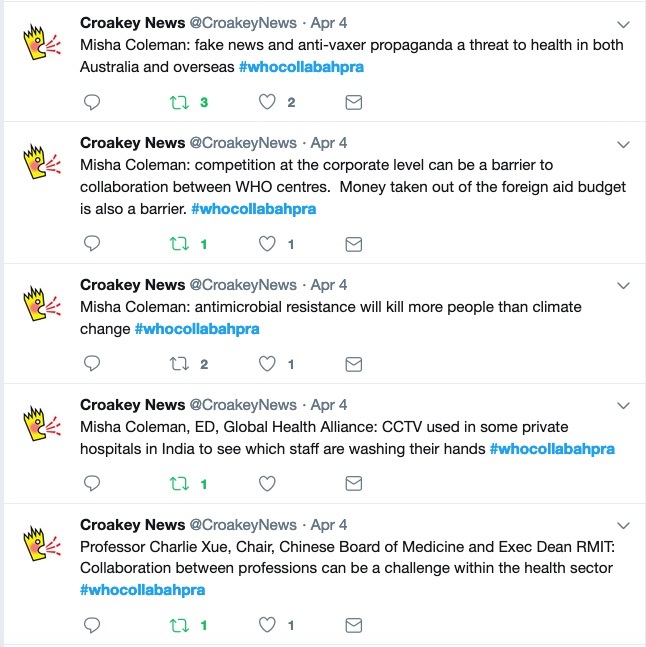 These are: a cross-systems approach; a consumer focus; using evidence-based strategies; public reporting; using funding levers; health professional education; and national standards. 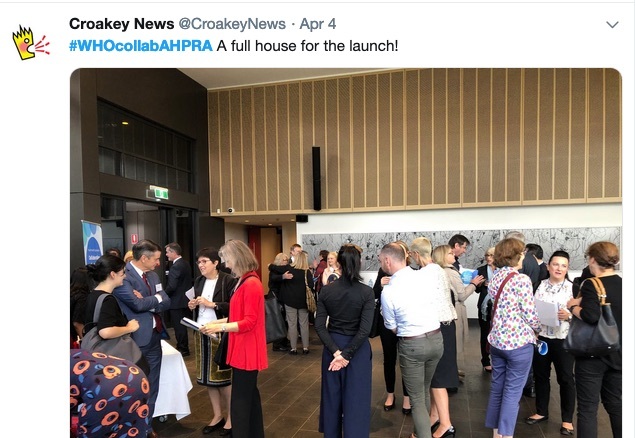 Also speaking at the launch was Darlene Cox, Executive Director of the Health Care Consumers Association and a member of AHPRA’s Community Reference Group. 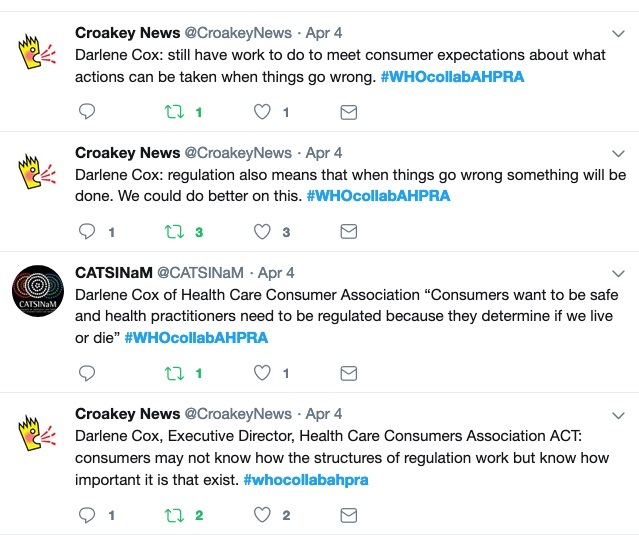 Cox discussed the importance of health workforce regulation to consumers, explaining that while consumers may not be able to explain how the regulatory system works, they do value the fact that it exists. 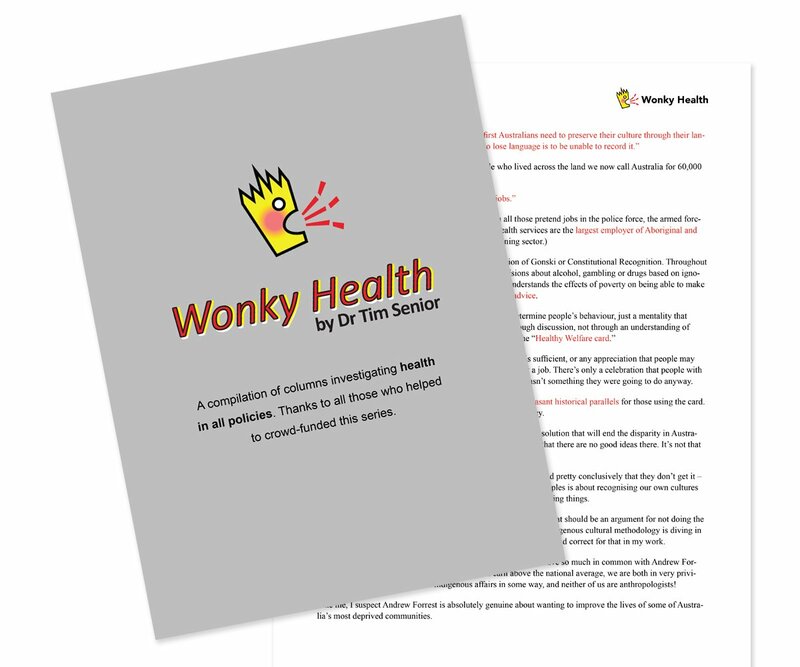 She stressed that safety is a high priority for health care consumers and identified some areas in which the regulatory system could improve in order to meet consumer expectations, including informing consumers about what actions can be taken when things go wrong. 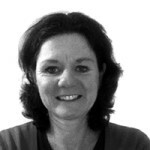 Following her address, a panel discussed how to assist a country with very limited health workforce regulation. 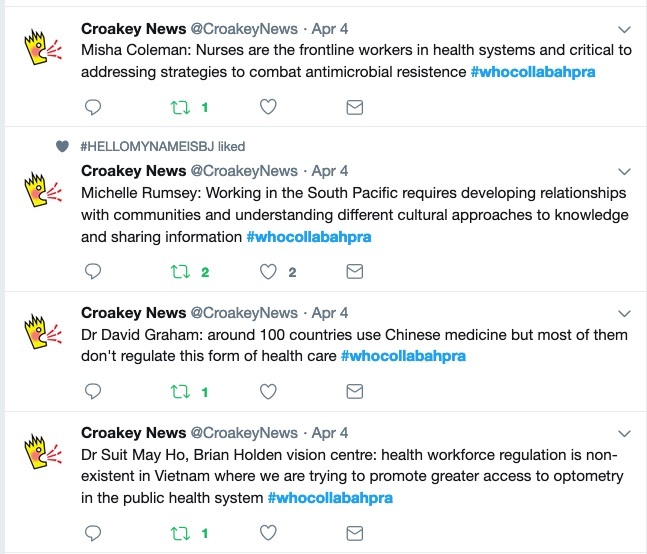 The discussion covered a wide range of issues, including the role of fake news and propaganda, the importance of nurses and midwives in promoting safe health care and the role of regulation in Chinese medicine. 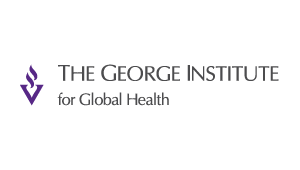 5) A safe health system depends on a safe health workforce. 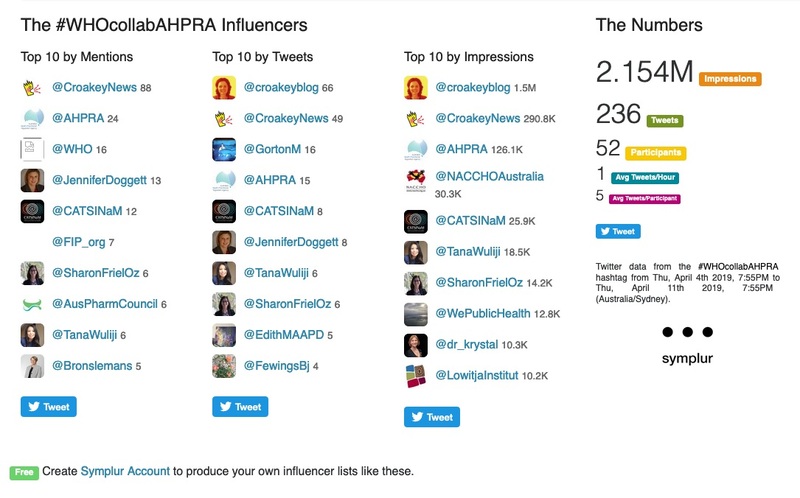 Between 4 and 11 April, there were 52 participants on Twitter using the hashtag, sending a total of 236 tweets and creating more than two million Twitter impressions, according to the analytics service Symplur (see more detail here, and read the Twitter transcript here). Four interviews and clips broadcast via Periscope during the event had a total of 448 views. 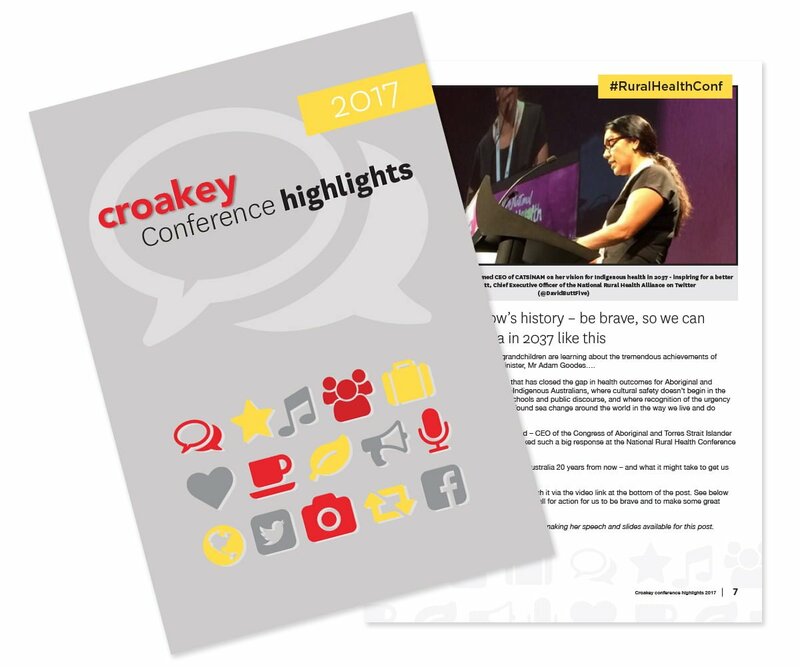 Jennifer Doggett covered the launch for the Croakey Conference News Service.